Lord Chancellor of England; born 1837; died March 1, 1899. His father was the Rev. Ridley H. Herschell. He was educated at University College, London, and at the University of Bonn, and took his degree at London University in 1857. In 1860 he was called to the bar, and in 1872 became a Q.C. and a bencher of Lincoln's Inn. Shortly afterward he was made recorder of Carlisle, and held that office for seven years. In 1874 he was elected member of Parliament for the city of Durham, which constituency he continued to represent until 1885. In 1880 he became solicitor-general in Mr. Gladstone's ministry and was knighted. In 1886 he was made a baron and became lord chancellor. 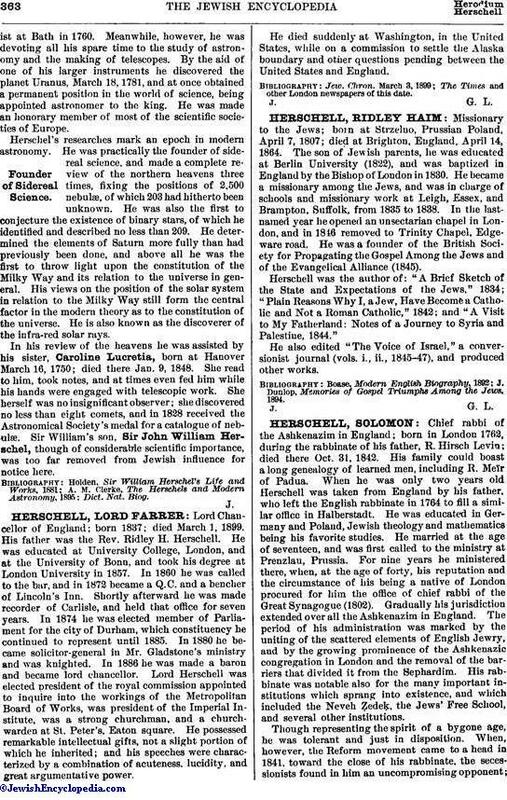 Lord Herschell was elected president of the royal commission appointed to inquire into the workings of the Metropolitan Board of Works, was president of the Imperial Institute, was a strong churchman, and a church-warden at St. Peter's, Eaton square. He possessed remarkable intellectual gifts, not a slight portion of which he inherited; and his speeches were characterized by a combination of acuteness, lucidity, and great argumentative power. He died suddenly at Washington, in the United States, while on a commission to settle the Alaska boundary and other questions pending between the United States and England. The Times and other London newspapers of this date.